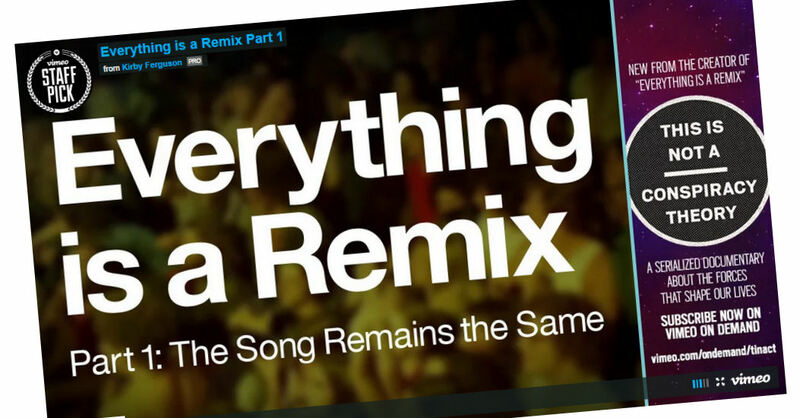 Everything is a Remix by Kirby Ferguson, a New York-based filmmaker. Everything is a Remix is a series of four short documentaries by New York-based filmmaker Kirby Ferguson about how so many new things (music, technology, ideas) are actually inspired and influenced by what has happened before it. I’ve had this on my “Must blog about this…” list for the last few years. 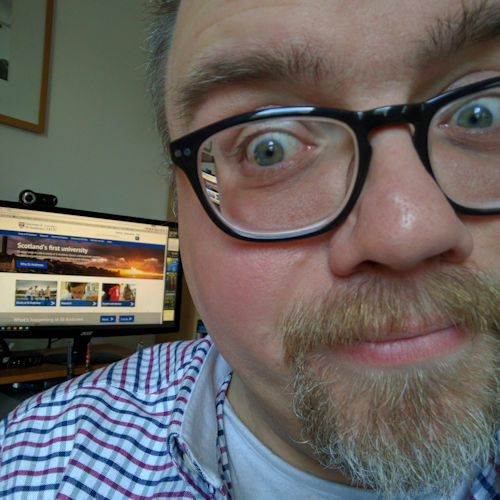 I kept meaning to blog about it after part four was released and… well, I forgot. Sorry. Part 1: The Song Remains the Same (7′ 17″) examines Led Zeppelin. Did they just rip off other people’s material, admittedly within legal bounds, and remix it to their own ends and success or was there more going on there? It’s a nice introduction, with plenty of examples, to the series. Part 2: Remix Inc. (9′ 47″) looks at movies. In the last ten years of the 100 most popular films 74 are either sequels, remakes of earlier films or adaptations of comic books, novels, video games, etc. “Transforming the old into the new is Holywood’s greatest talent,” Ferguson notes. Standard elements are appropriated, transformed and subverted to create something new. And yes, Star Wars is in there. A lot. After the credits roll Ferguson goes on to briefly look at Quentin Tarantino, and in particular Kill Bill. Part 3: The Elements of Creativity (11′ 16″) opens with the words, “the act of creation is surrounded with a fog of myths […] but creativity isn’t magic.” Ferguson talks about copying and emulation. The greats, whether in music, literature or comedy, started by copying others and then slowly tinkering with them to create something new. The most creative leaps are when different ideas are combined. To explore this Ferguson looks at computers, begins with the kings of copying: Xerox and its role in bringing the Apple Macintosh to the mass market as a home appliance. Following the credits Ferguson asks the question: if some of these great inventions, such as Sir Tim Berners-Lee creating the World Wide Web, hadn’t happened then would the world be a vastly different place today? He argues not. Often when something amazing is created there are often others working on something very similar at the same time. Part 4: System Failure (15′ 26″) is the final part of the series. It begins with Luca (the Last Universal Common Ancestor) which is a core element in understanding evolution’s work of copying, transforming and combining. Culture does something similar, not through genes but memes (ideas, behaviours, skills). Ferguson looks at the legal aspect of ideas. The law seems to think that ideas can be protected, that the boundaries around them are tidy. But in reality they are tangled and interdependent. For most of our history ideas were free. They could be copied and built upon but the market economy changed that. Our ideas could be bought and sold. Having briefly looked at issues surrounding intellectual property and copyright laws he goes on to explore the fuzziness of software patents and litigation that has led to conflict rather than creativity and progress. Ferguson ends with the challenge that to address the problems of today we (not corporations or governments) need to come up with the best ideas, we need them now and we need to spread them. Maybe this focus on over-protecting our ideas isn’t the best way forward, and given the evidence perhaps it’s not even accurate to say that anyone’s idea is unique and original: after all everything is a remix.